- Data files corrupted after the transfer has been made. - Data not in sync when it is transferred to the computer. - Transfer is interrupted during the process so it is incomplete and has to be restarted over again. There are many programs available to help users to transfer data between a phone and a computer. Because all of these applications are not the same, people will need to pick and choose the application that will work best. In this article, we will show you a few different tools to perform the photos transfer between Samsung Galaxy S8/S9 and computer. Step 1: Connect your Samsung Galaxy S8 or S9 to your computer via a USB cable. Once connected, your computer will recognize the phone and show it as a removable USB device. Step 2: Click the Notifications panel appeared on your S8's screen and choose the option of "Media device (MTP)". Then, click "OK" when the "Allow USB debugging" option popped up. Step 3: Make sure the proper drive of your Samsung Galaxy S8 is installed successfully on your computer. After that, you can click to open the file folder of your S8 and select the "DCIM" folder, where all your wanted photos are located. Step 4: Choose the photos you want to backup, and copy them from Samsung Galaxy S8/S9 to your computer. A competent transfer program should walk you all the way through the process easily. This is one of the main reasons why people who have tried it before recommend Coolmuster Android Assistant or Coolmuster Android Assistant for Mac. It enables you to transfer photos from/to your Samsung Galaxy S8 on PC or Mac, and even transfer photos from one phone to another phone with very simple operations. Apart from that, Android Assistant allows you to edit Android data on computer, send text messages from computer to phones, delete all of the data from a device and so forth. All of which can be done within only a few steps. Here are two free trial versions (Windows & Mac) of the Android Assistant, you just need to download the matched one and follow the below mentioned steps to transfer photos between Samsung Galaxy S8 and computer. First of all, you should launch the Coolmuster Android Assistant on your computer. Then, you must connect your Samsung Galaxy S8 with the computer using a USB cable. Make sure you have enabled USB debugging on your phone first to let the program detect the phone and show it on the main screen. Simple select "Photos" on the left side menu and all images on your Samsung phone are listed on the right. Select those you want to transfer to computer and start to transfer them to computer by clicking the "Export" button. What's next is to choose a location on your computer to save the exported photos. Choose "Photos" category on the left side menu and click the "Import" button on the top menu. Then, a file browsing window will pop up, asking you to find the pictures and photos from the computer. Just choose the files you wanted and click OK to import them to the connected Samsung Galaxy S8. 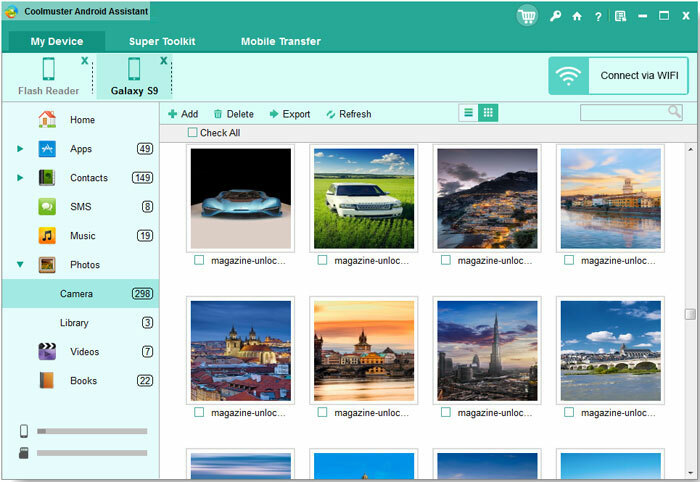 To directly sync pictures between Samsung Galaxy S9/S8 and computer, you can try another software Coolmuster Mobile Transfer (Windows) or Coolmuster Mobile Transfer for Mac. It does a great job in transferring data, such as contacts, text messages, photos, videos, music, apps, etc. between two devices, and it also enables you to backup phone data on computer, and restore files from computer to your phone in one click. The buttons below are for you to download the Mobile Transfer without charge. Step 1. After you have installed the Mobile Transfer on your computer, you can run it directly. Then, connect your Samsung Galaxy S8 phone to the same computer via a USB. Step 2. Click "Back up Your Phone" from the program interface to enter the Backup panel. After that, all the transferable file types are listed here. Here, you should tick off the "Photos" category only and click "Start" button to start moving all photos from your S8 to computer. Step 3. Back to the primary interface of Mobile Transfer, choose "Restore from Backups", select the file types (here is "Photos") you want to transfer back to your phone and click "Start" button. Then, all the photos will be restored from the backup file to your phone immediately.